This evening I don't have much time for dinner prep. I have a visitation to attend for a former coworker who tragically and unexpectedly lost her daughter this week. So, I have about 30 minutes before I need to head back out the door this evening. I had about 3/4 - 1 cup of diced rotisserie chicken breast left in the fridge, so I decided to make a quick little chicken salad for myself. I wanted to try using all Greek yogurt instead of mayo to make it. I put 2+ tablespoons of Greek yogurt in a small bowl and mixed diced celery, sliced green onions, cayenne, black pepper, a splash of tamari, a pinch of sea salt....and somehow, I just still couldn't get past the tartness of the yogurt...so I caved and stirred in 1 tablespoon of mayo to the mixture to make it palatable. I piled it up on top of one of the little slices of toasted grain free bread I made on Saturday and sprinkled it with toasted slivered almonds and it is actually good -- I'm eating it as I type! This is multitasking to the max -- I'm eating (and typing), the pooch is eating while I wait for hubby to finish up his meeting so he can meet me at the visitation. 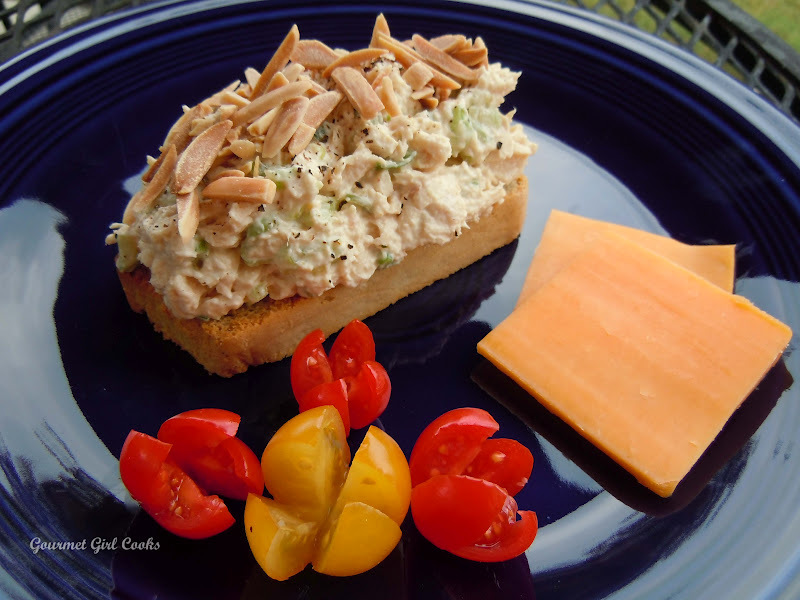 Back to the chicken salad...there are enough other flavors going on now in this chicken salad -- and the tiny bit of mayo helped blunt the tartness a bit. The toasted almonds on top just take it over the top for me. Funny thing is, I actually like Greek yogurt and usually eat it for breakfast 5 days per week with some stevia and cinnamon...so I'm a bit surprised that I wasn't overly crazy about it mixed with the chicken and other ingredients. I will have to play around with a mixture another time until I get it perfect -- this is actually good though (of course, I'm looking for fantastic). :-) Check out my pic below. Enjoy!